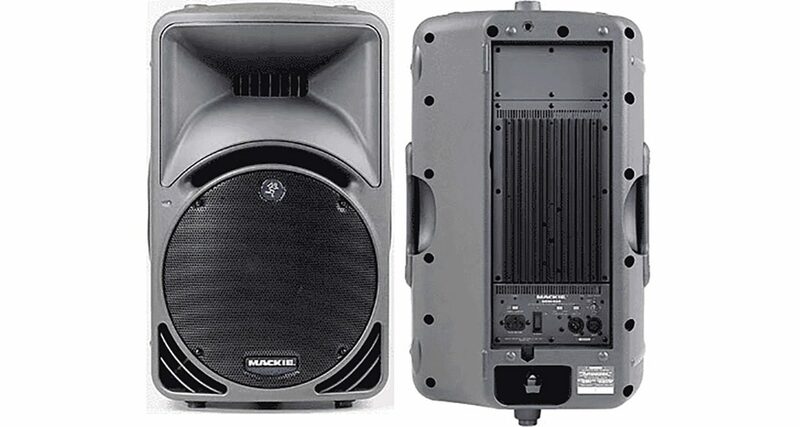 The Mackie SRM450 PA speakers are a good workhorse, but consider a subwoofer and definitely budget for stands too. 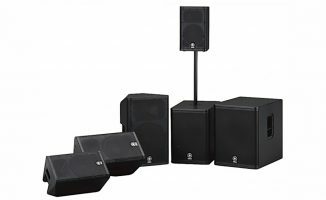 We haven’t reviewed any PA systems so can’t give you a list of choices, but our experience (and apparently backed up by some members of our forum where you asked this question) is that Mackie SRM450s are a good active (ie no need for a separate amplifier) speaker. There’s a big difference between 100 and 400 people though, and for bigger parties you’ll need a sub-woofer too (a bass speaker to sit on the floor), and it’s also imperative you buy a pair of stands for the speakers so you can position them correctly for maximum impact. This will take you over your budget so you may have to shop around. For the record, our own PA is really rubbish, a second-hand $200-out-of-the-newspaper system that we take to parties where we don’t expect to get it back! How we’ve managed to keep it so long I don’t know, but it still seems to keep working. But if someone was hiring me to do a serious/paying gig I’d definitely use something better. As a non-mobile DJ, I always use the gear wherever I play, which is why I can’t give you much first-hand advice – other than possibly to consider hiring systems to see what works for you before buying. So, over to you: Do you have a good sub-US$1200 recommendation for Ginger? Should he buy a subwoofer too? How important are stands? Please share your thoughts in the comments. Your Questions: PA Or Studio Speakers For A House Party? Your Questions: Which Is The Best Portable PA System? I’ve been looking for this PA package for quite sometime, maybe you guys can give some thoughts on this one. Harbinger are really low end speakers. 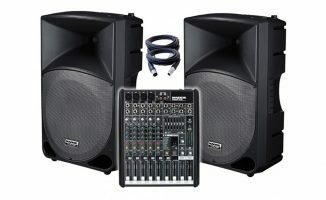 I Heard them live Vs. these: http://www.behringer.com/EN/Products/B212D.aspx each Behringer is like $230us and they CRANK! so obv. i went with them. I’ve done indoor parties with 400people and they worked fine. Also they carry really well outside, I used them for a few corporate events. I cannot reccomend The Behringer B212D, as I had very negative experiences with the B215D’s. The pair I bought worked fine for about 12 hours, then one of them started randomly powering off. About a day later, the Horn on the second speaker stopped functioning. One failure I could understand, both failing in different manners was a sign – I returned them, and replaced them with some cheap Mackie TH-12As, while they dont have the impact a 15″ PA had, they have been very reliable, and much more mobile (about half the weight). I don’t own them but I’ve heard them. They sound incredible. I auditioned the new Yamaha DXR/DXS active series last week. Was so impressed I’ve ordered 2 x DXR12 (full range) and 2 x DXS15 (subs). They are without doubt the best “mid-priced” actives I’ve heard. I got a pair of the JBL EON 515 XT powered cabinets. I swear by them. Having bought cheaper self powered cabs before, (Peavey PR15 D) I’d say spend the money on a good pair!! I’ve done gigs of 100-400 range and I agree with Phil on needing the sub to fill the space. Good luck! The B52 Matrix 1000 is an option if you don’t want to piece together your own system. For $1000 you get a subwoofer and 2 speakers- you won’t find many other subs in this price range. Bought a pair of Red Fire Audio 500w actives + a 400w sub with all cables and stands for under £900. went to a shop and listened to everything within my budget including the srms and but nothing sounded as good or was cheap enough to include a sub aswell. they are based in America so you might find them chapter also. I have the Behiringer B215 speakers and Behiringer B1800D sub. I got the speakers and stands used but the sub new once I started booking bigger gigs. They work perfect for me and Im not really looking to upgrade anytime soon. total cost with out stands is around 1K US. if 1200 is the budget you save $$$ or can get some lights too. whats the sound quality like and do the passive version of these speakers have the same sound quality? For a great bang for the buck a pair of Behringer EUROLIVE B215D Active speakers (http://www.musiciansfriend.com/pro-audio/behringer-eurolive-b215d-active-pa-speaker-system) with a Behringer EUROLIVE B1800D-PRO Active 18″ subwoofer (http://www.musiciansfriend.com/pro-audio/behringer-eurolive-b1800d-pro-active-18-subwoofer) and a pair of speaker stands (http://www.musiciansfriend.com/accessories/musicians-gear-speaker-stand-pair) for just under $1200.00. Then get some XLR cables from Monoprice.com to save even more money (http://www.monoprice.com/products/search.asp?keyword=xlr). These speakers are nice and clear with a nice punch at any volume. Mackie SRM450 are price/quality a winner. But as soon as you use them in bigger venues or for parties over 100-150 people (and I mean parties, not weddings) you need a sub. When you crack up the volume you will lose the lower frequencies, sound will be harsch. I use a pair of QSC K12s and a QSC KSUB, I love the fact the Sub has wheels to move it. The sound quality of these are amazing. Out of sixteen years of experience, these by far are my favorite. +1 on these also… I had the Mackie 450’s until I saw that they easily clipped, and were going out for minutes at a time when i was running them hard (not even when they started to clip)… Got the QSC’s and the sound quality is above the Mackies IMO… and they come with an internal fan, so less chance of overheating… I got the sub too… Awesome little system. I do agree, that K181 sounds fantastic. The JBL PRX618-XLR is also right up there with it. 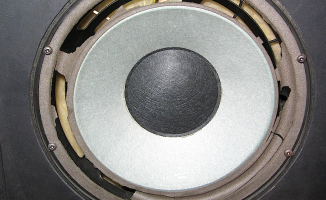 The JBL can supposedly get a little lower AND has caster wheels mounted to the back, like the K-sub. This is a good deal on powered speakers and sub, Peavey brand for $1030. I have heard great things about the Alto TS112A’s. I plan to get 2 of these in the near future. Check them out. For 1200 $ you can get a pair of JBL JRX 125 and a good amplifier without any problem. I’ve been using them for weddings for years and they work very well however for more that 200 people you would need subs as well. I see a lot about the QSC K series. Although they are some of the best sounding speakers out there, you won’t be able to even purchase them used and stay on your $1,200 budget. The smaller K8’s would run $500 each minimum, and a used K-sub would run $900 minimum. So, you’ll need minimally $2,000 for a used, small set of QSC K series. 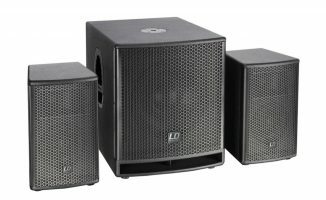 What about renting a PA before buying? There a probably PA rental stores in your area that cater to Mobile DJs and rent systems on a one-night basis. I used to use these specialty shops occasionally – but this was almost 20 years ago. But I bet they’re still around. Have the EV ELX-115P tops ($699 each), and just added a matching ELX-118P sub ($799) for some added low end. Has been used for parties of 500 people indoors, and 300 people outdoors, and easily had enough punch to keep up. Will probably add another sub down the road. Previously owned the JBL EON 515 and Mackie SRM-450, and the EV’s put them to shame. One EV does the work of 2 of other cabinets. I like the Mackie Thumps with nice bass box to fill. You can do the hole package for under a $1000.00 or the speaker polls and cables for around $600 without the bass box. I do a lot of parties and corporate events, I have a pair of 15 inch JBL Ions and a pair of XLR cables to my mixer. They are light, loud and very efficient. I have never felt the need for a subwoofer and never had a problem with enough power. How can I work a subwoofer into my PA system if I’m working right off of my Traktor S4? How could I work a subwoofer into a PA system of I’m using a Traktor S4??? Save just a little more, and pick up a used pair of Mackie SRM-450’s. Should be able to find a pair for around 750 or 800. I have the EV ELX112Ps. These speakers hit extremely hard, part of it being due to the wooden cabinet. I use the QSCK12s all the time and mine hit a lot harder on the low end. Also the new EON515XTs push a lot of bass as well but those are 15inch woofers compared to my 12s. Would echo what many others have said already, you can’t go wrong with the mackies! They are affordable, high quality speakers which are literally bomb proof. I got a pair of them with carry bags. Super easy to move around and have never had any issues with them. I find that if you play at bigger venues than 200ppl then there is typically already another PA system in place, if not you can just beef up by renting a sub and an extra pair of 450s for the night. Hi, I have new room 5.5meter wide 7meter long 2.8 meter Height ,I need to buy PA Speakers Am a Dj house/techno, ITS NOT a Studio its like small club or Lounge . Am looking for something Has Clear , Sonic ,Punck,kick feeling. Please head over to the Digital DJ Tips Forum (http://www.digitaldjtips.com/forum) to ask questions where the whole community can help you. It’s probably time to approach this question again, I’m sure Ginger found a solution by now, but there’s at least a few Gingers out there, every year, and they can use our help. This is however, an exhaustive task… like buying computer parts. It is worthwhile to consider 4 smaller P.A.s (which do cost more), but this configuration is a lot more flexible, and tuneable.